Running With Horses: Been Real, Been Fun, and Yes, It's Been Real Fun! Been Real, Been Fun, and Yes, It's Been Real Fun! * with the appropriate New Year's week subtitle ... Looking Ahead By Looking Back. Exactly five years ago this week, Christy and I were on our way to Florida for what was to be my first, and only, marathon. That somewhat common, middle-aged bucket list line item had been put in motion just six months prior when it seemed like the sort of thing that would bring great challenge and fulfillment. I had no idea what I was getting into, nor did I fully understand how following the plan would result in completing 26.2 miles in relative comfort. Don't misunderstand, it was not easy, it was not without sacrifice, and it was not free of minor aches and major soreness (especially post-race), but I vividly recall running across the finish line at Disney World and thinking, "Did I just do that? Me? Wow, anyone really can do this! Maybe I'll run another one some day." Well, the transition from "the one-and-only" to the craziness of pursuing fifty of them is well documented. And now, five years later, I sit here reflecting on just how much fun this pursuit has been. So much has changed over five years - from careers to our empty nest status around the house - but what hasn't changed is just how much of a happy place the marathon starting line has become to me, every single time. And when I think back, I realize something else about these happy places; the experience of sharing race day with family, friends, and so many incredibly kind and encouraging strangers, is something that makes it all worthwhile. Though training is often completed in long, quiet runs at odd hours, race weekend is about relationships and shared journeys. So before I look ahead, I thought I would take just a brief moment to survey the first five years. Don't worry, this is not a recap of each race, those are found elsewhere. Rather, this is a list of questions I am often asked, with responses that are formed by the experience of going the distance sixteen times. 1) Savannah, GA (2013) My current PR on an absolutely beautiful morning with my wonderful wife providing chocolate kisses at mile 23! 2) Chicago (2012) Perhaps the greatest overall experience - It's Chicago! Thousands of people, sights, sounds, and history. The only one that I would consider running twice. 3) Disney World, FL (2011) Of course. I highly recommend as first marathon for anyone. 14) Knoxville, TN (2013) Tough course--up the mountain, down the mountain, repeat--on hot day, but finish in Neyland Stadium is nice. 15) Baton Rouge, LA (2013) Double loop on frigid day. Course was not great with only interesting sights through LSU campus. 16) College Station, TX (2015) See previous post on why this one is last on the list. I'm sure over time the stroll through Aggieland might move up the list. What is your favorite medal / race swag? All of the medals are pictured at the bottom of the blog home page, and there are many interesting ones. I think my favorite is the Marine Corp Marathon medal. It symbolizes the race atmosphere and D.C. landmark memories for me. For swag, I have to give College Station props. They provided not one, but two tech shirts (long and short sleeve), a nice pair of ear buds, 1/2 gallon of chocolate milk, and pizza rolls. Have you found a favorite playlist that works better than others? There have been numerous attempts at playlists, from random shuffles, to friend-created, to all-Bruce, to talk shows, to tempo driven selections. If I were to consider the playlist as having been integral to the performance than I would have to say that the praise & worship playlist in Savannah is perhaps the best. The intentional tempo selections were also part of the faster outings. On the other end of the spectrum, I will never listen to talk shows or run without any playlist (Pocono, PA) ever again. These were mental disasters. Have you ever considered stopping the 50 States pursuit? 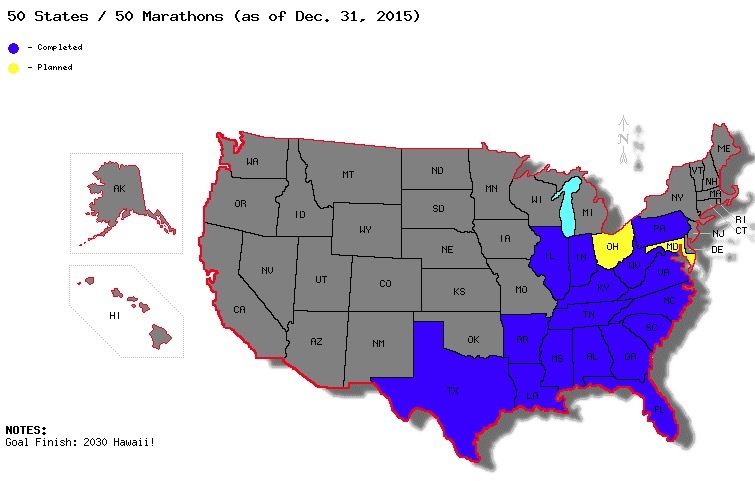 Yes, between miles 22 - 26 in every single marathon! But ultimately the desire to run and find that next adventure wins out. So far, I am still in, but we'll take it one race at a time. As long as I find running enjoyable, I'll try and figure out how to make it happen. How fast do you run a marathon? Hmmm, how best to answer this one ... it all depends. My fastest is 3:31 (Savannah) and my slowest is just over 6:00 (College Station). For the first couple of years I was keeping the average below 4 hours, but with the last four or five races, that has slipped. Age and lack of training, coupled with a few less than advantageous courses (in other words, hills and big boy runners don’t go together well), has moved the needle to an average of about 4:15. I think I still have some sub 3:45’s in me, but time will tell. Finally, when will you complete your 50th Marathon? Originally the plan was to complete three per year for almost 17 years. I would have run #50 (in Hawaii obviously) near my 59th birthday. However, plans do change, and the reality of the first five years just doesn't seem to be the reality of the next five. The constraints of time, life stage, and finances -- not to mention that I've taken care of most all of the same-day drivable locations -- would seem to point to a completion age of something closer to 65, or even older. I have taken the position that the journey is much more fun than the arrival. If the Lord wills, then I'll someday be honored by the club for finishing them all. If not, then it will continue to be fun planning that next one whenever it might be. Hope to see you all out there at the happy place!